Our work has enabled over 550 businesses, charities and individuals from around the world take advantage of the opportunities a fantastic web presence can bring. We have got the skill set, framework and experience to handle any type of Web Project, from a comprehensive website for a Multinational like Diageo, to an e-Commerce site for a local Sole Trader. Our project process is a key differentiator for us in that we follow PRINCE2 best practice. A PRINCE2 practitioner project manager will look after your project from start to finish. "My heroes! 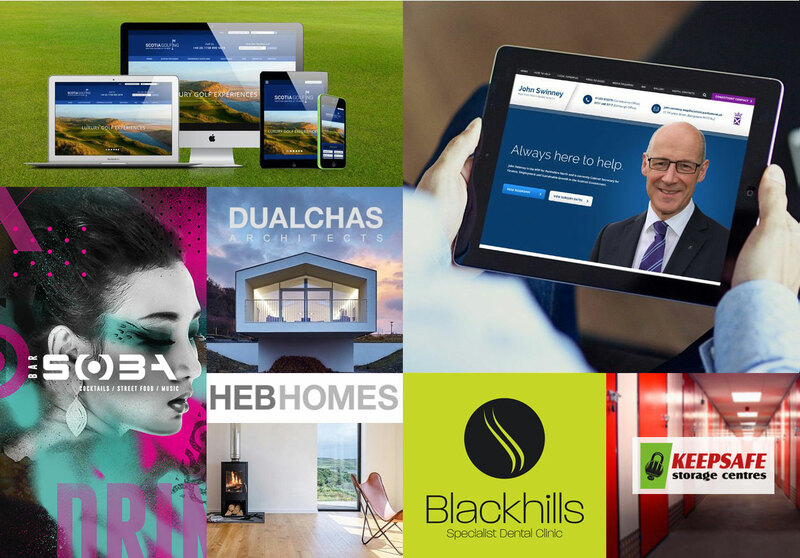 The standard for all web design companies to aspire to"
"Inspire IT has provided Blackhills Clinic with a great customer-focused service and we have built up a good working relationship. Inspire are willing to listen and take on board our needs while at the same time provide very practical advice. This allows us to make confident and cost-effective business decisions on website development and would recommend Inspire to any company for web development, knowing that their business internet presence is in safe hands." "It has been a pleasure to deal with a company who respond so quickly and efficiently to emails, telephone calls and multiple requests. Excellent customer service and more to the point creating a website better than we envisaged. Nothing has been too much trouble. Do not hesitate to get in touch with Inspire, you shall not be disappointed." I've had an excellent experience with Inspire. They built my website from scratch and provided a very comprehensive, personalised service including web design, training, SEO, e-marketing, online security and ongoing reviews. Inspire have gone beyond my expectations and they have exceptional knowledge on all aspects of IT for businesses. I would definitely recommend them. David and his team were exceptional and went above and beyond my expectations. Thank you very much and will continue to use their services in the future. Fantastic customer service and value for money. Definitely recommend!!!! The project was managed professionally throughout and the team at Inspire demonstrated admirable patience and flexibility as they juggled with a number of our ‘afterthoughts’. Many thanks for taking us through minefield of web site development. You and Martin were first class. The website looks really good; Drew and I are very pleased with the end result. Delighted with the website. Since we have replaced our old site with the new one we have seen significant improvements in our accommodation and meal bookings. We would recommend Inspire to anyone. Efficient service, friendly, helpful team. Would definitely recommend to anyone looking to build their online presence.
" I have found David and Frazer to be extremely helpful with web design and assistance throughout the year. The TDS web pages are an invaluable tool for business development. The team at Inspire have always been very approachable and make good sensible suggestions to resolving issues as they arise, allowing TDS to focus on dental defence work. Neil Taylor"
"Would highly recommend, fantastic service received both times as we have now had two websites designed by Inspire, David and Frazer are a pleasure to work with, always on hand to assist you any time of the day." "I have engaged Inspire for the last 18 months and the team have always delivered for me. They deal with my requirements with patience and total professionalism. Regardless of the size of the job they always respond with the same degree of energy and focus. A charming organisation who I highly recommend for web site hosting and web site development." "Inspire IT were recommended to us as a leading web design house in the Perthshire area. We have not been disappointed. Inspire IT have produced a first class website, enables a smooth transition of website ownership and provided a seamless service with our booking engine"
I, James Irvine of Positive Mortgages would like to thank you and all your team at Inspire for the amount of time which your company spent on designing our website and I would not hesitate in recommending your company to everyone I know. We initially chose David and his company to work on our web site to improve our listing on searches. Following this we have now engaged him and his team to completely redesign and relaunch our web site. I can't recomend them highly enough. You really need to talk to David about your website if you are serious about your website. Our reward for entering our FB Competition as you all know is that we have 3 tickets (Celtic End) for the Glasgow Derby. As we highlighted recently, no matter how effective your online presence might be, it is all for nothing if you’re compromised by malicious actors.